Most owners and property managers would agree that turnover is a given and stands in the way of making profit. So how can you reduce turnover? A combination of better communication with tenants, making renting easier for tenants, and building a relationship with tenants is key. Why does turnover matter? The cost of turnover is expensive. The costs to take into account include the collection of overdue or unpaid rent, legal fees, marketing and advertising of the available unit, cleaning and repairs, lost revenue from vacancy, tenant screening of new applicants, labor for repairs, showings, calls, and processing paperwork. All of this can range in total cost from $1,000 to $5,000 per unit, depending on the size, location, repairs needed and time vacant, says Property Management Minutes1. Additionally, a survey of over 3,000 properties showed that the average unit turnover was a shocking 54%2. Imagine an owner has a property with 10 units and average 54% turnover. That results in $5,400 to $27,000 of lost revenue each year. By reducing turnover to just 40%, the owner would net an additional $14,000 to $70,000 over a 10 year period! On top of this, the total cost calculated (explicit cost) still does not account for the opportunity cost (implicit cost) of what an owner could have done with that time and money it took to fill a vacancy. Today, ordering a present for the holidays, purchasing new music, booking a hotel, and paying for your morning coffee can all be done from your phone. Companies like Amazon, Apple, Hilton, and Starbucks all know that putting themselves into your phone is the way to create not only customers, but repeat customers. They build a professional relationship, and then use that relationship to retain customers and drive profit. So how does this relate to tenant turnover? You may only see a tenant if he/she comes to your office with a problem or you have to go to them to collect or evict. In either case, the relationship is already damaged at that point. Instead, use tenants’ smartphones to build a professional relationship. Technology allows you to build a professional relationship with a tenant even when you may not actually see the tenant after they move in. Today, people live on their phones. In fact, the global number of users on mobile phones surpassed the number of users on desktops in 20143, and the Pew Research Center shows that 9 of 10 Americans are online, with more having access to a smartphone than even home internet4. Responding to emails, catching up on the news, posting on Facebook or Instagram, and reaching out to family or friends no longer require people to fill out paper letters or log onto desktop web portals. Connecting to the tenant on their phone is like knocking on their front door. Over time, connections and touch-points build a relationship with the tenant and lower your turnover. So why doesn’t every property owner just build an app for their renters? Building out apps for smartphone users can get pricey and time consuming. Also, who is going to manage this software and continue to fix it if your tenants experience any issues? 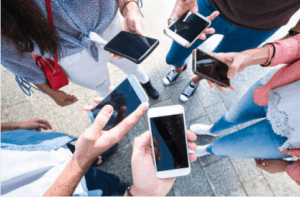 To address this issue, RentRedi has taken on the challenge of connecting landlords directly to the tenant’s smartphone. Our platform was developed for mobile use, making it easy for tenants to pay their rent, submit maintenance requests with video, and set reminders for themselves for utility payments, cable and rent. When tenants have an easy and automatic way to pay rent, they are more likely to pay on time. When tenants have an easy way to submit maintenance requests, they are able to go on with their other tasks and the maintenance issue becomes less stressful. Less stress for a tenant means lower turnover. Landlords can also communicate using mobile notifications. This is probably the most underutilized tool that landlords can take advantage of to build a relationship and reduce turnover. Sending an email can end up lost among hundreds of emails that a tenant receives each day and often gets set aside for more pressing issues at the moment. Placing a call to a tenant may reach them, but oftentimes ends with voicemail and you probably don’t have time to call every tenant anyway. Mobile push notifications, on the other hand, show up on the tenant’s phone immediately and can be a great way to build a relationship if used sparingly but wisely. At RentRedi, we saw the need and opportunity to build a platform that allows landlords to send messages to connected tenants, allowing them to immediately be seen on the user’s phone screen. One way to help renters feel welcome and connected is by using notifications for building notices like a change in garbage day, or for rent reminders when the tenant is a few days late. The more connected the tenant feels, the less likely they are to move at the end of a lease. Landlords can use this technology to send a personal notification to a single renter or they can alert all renters in a building of an important change or upcoming event. Imagine all of your tenants in a building being notified in one moment of a summer picnic in August, four months before most leases renew. They will like the notification, talk to each other about the event, connect with each other, and post photos to Instagram or Facebook, all building a relationship that reduces turnover and increases profit. All of this ends with time saved for you, improved relations with tenants, and, ultimately, lower turnover. The tenant’s mobile phone is your answer to lower turnover, and there should be a way for you to afford that solution, whether you have 1 unit or 50 units. If you would like to learn more about how RentRedi can help you do just that, please feel free to call us at 917-793-6068 or check us out at www.rentredi.com.